10.25.2004 - This was a rare case of raccoon removal. There were raccoons in the house, which is not uncommon, but they were in an uncommon place. In almost every case that I've dealt with thus far, the raccoons are in the attic. However, in this case, all the noise was heard in between floors, above the first story ceiling and below the second story floor. There's not a whole lot of room in that space. However, critters have a way of fitting in tight gaps. I thought that the animals would be rats, or maybe squirrels, based on the location. However the homeowners were hearing vocal chattering. When I did my imitation of a baby raccoon, they said, "Yes! That's what we hear!" So I had to suspect raccoons. I carefully listened and felt at the walls in the general area where the noises were heard. I was having trouble detecting anything, and I thought I heard noises coming from several places. I finally became confident enough to cut an opening in the ceiling. I was careful, in case I was right on baby raccoons. I used my inspection mirror and found three baby raccoons nearby my hole. It was a tight gap, but I was able to pull out the babies, as seen in the above photograph. But I still heard some scratching noises. After another long investigation, I realized that one of the babies had crawled and fallen down a nearby wall. This is why I was confused about the noises coming from different directions. I cut a hole at the base of the wall and removed a fourth baby. I used the babies in the back of a trap to catch the mother raccoon. She was going under the elevated home and she'd torn a hole in the floor and was crawling up an inner wall and nesting in the ceiling. After I removed her, I crawled under the house and patched the hole shut. 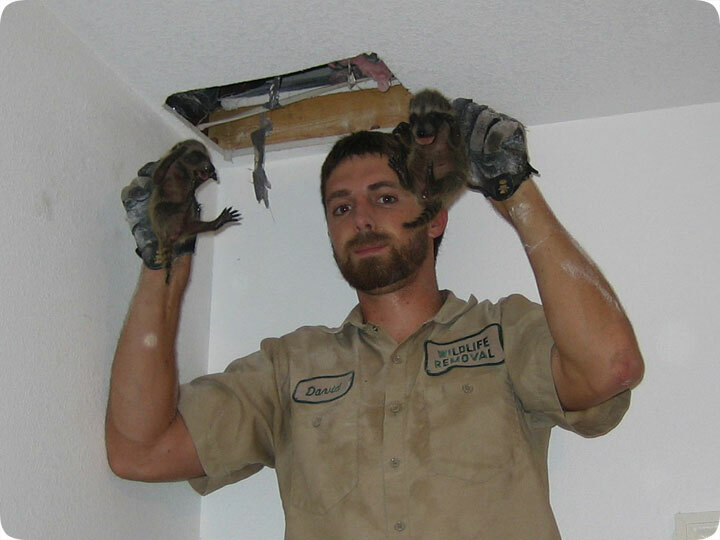 How to get rid of raccoon inside ceiling - Most of the time, the scratching and strange sounds you hear in the ceiling indicate a raccoon in the attic. Attics are the gateways into most other areas of the home. It’s not difficult for a raccoon to make its way down the gaps of the walls and eventually into a ceiling. Most of the time, if a raccoon is this far into the home, it’s because the critter is a female who has just found where she wants to have her litter. This is actually a good thing; remember where you hear the raccoon making noise. Once you have her trapped and removed from the home, you’ll need to locate the babies immediately to ensure they don’t starve to death. If you’re really talented, or if you find a good wildlife removal company, the babies can sometimes be removed before the female is out and used in a cage trap to lure the mother in. If it is time to remove the young kits, remember that getting to them might not be possible from the attic. You may very well need to cut a hole in the drywall of your ceiling. This should be done with utmost care; you don’t want to injure any of the young raccoons. Removal of babies is another reason why the help of a professional is needed for raccoon removal.